There are 3 basic stages one will go through when installing a pond or water feature: researching, planning/budgeting and execution. 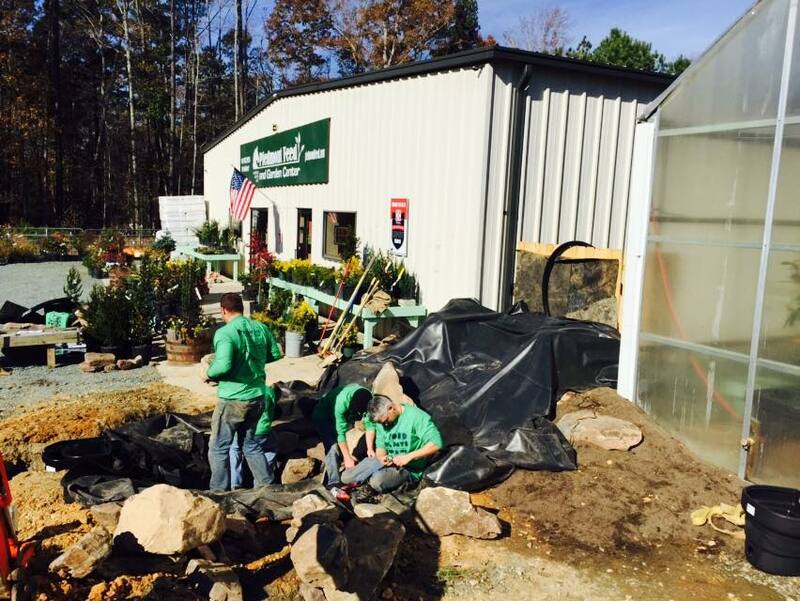 Through our over 18 years of experience in the pond building business at American Aquascapes, we have found that customers often need guidance. We are here to help! We'll take you through each of these phases and provide some suggestions of things to consider and questions to ask. Where do you want to install it? This affects both the size and type of water feature that's right for you. Do you want fish? If the answer is "yes" then an ecosystem pond is a great choice. What types of plants do you want? In order to have fully aquatic plants, the roots need to be fully submerged in water. Is there power available nearby? Power is necessary for the pump and lights. A standard receptacle is sufficient. Do you want to DIY or hire a contractor? This will affect both your time and cost. Are there any HOA policies or other ordinances that may affect the project? There are typically no problems with these issues, but it is best to be sure. You may very well have additional questions or topics to research, but the list above should get you started. How much is in the budget? While there are options that come in under $500, the cost of a pond installed the right way by a professional starts out around $4,000. Beware of contractors who bid under this as they are probably cutting corners and the results will not be the same! It's fine to do some bid comparisons, but don't simply choose the lowest bid. The money you save initially could be lost...and then some! What type of contractor should you contact? Ideally you should choose a contractor who specializes in pond construction. A quick search online for companies in your area is a good place to start. Be prepared to pay a small fee for design consultation services. Contractors make their living selling their time and expertise so time spent consulting is no different from time spent building your water feature! Are they licensed, insured and do they have a good reputation? Having a contractor that is properly insured and licensed is a must. Even the best and most experienced ones will experience a problem now and again. Search social media, review websites and more and see what other people have to say about their services. If you personally know someone who has done business with them...even better! Do you like their previous work? Just like tastes in art, different people will have different tastes in landscape design. While a good contractor can build a water feature to suit many different tastes, it's important to know that the contractor you choose can make your vision become reality. Ask them to show you a portfolio of their work or tell you where you can look at one of their finished ponds in person. If you are looking for a Certified Aquascape Contractor in North Carolina, we are here to get you started building your paradise! You've contacted contractors. You've done your design consultation and chosen what type of water feature you want. You've gotten your bids. Now it's time to make it all happen! What preparations do you need to make? The contractor should go over what preparations you need to make, but it never hurts to be sure. Example questions include: Do you have outdoor pets that need to be kept out of the backyard? Will the contractor be able to access the power and water going to your pond if you are not there? Have you made payment arrangements and put down the requested deposit? What is the timeline for the project? You don't need to know every little detail about you pond installation, but it's good to have a general idea of when each phase of the project is going to happen. When is the digging going to take place? When will the pond be ready to be filled up and the project completed? The contractor may request your presence at certain points, so be prepared to make yourself available. Have you or the contractor called a utility location service? Typically, the contractor's insurance company requires that the contractor call 811 before any digging takes place, but we recommend that you confirm this has been done before the project begins. Without knowing what utility services are buried on your property, you run the risk of damaging cable, power and even gas lines! Who will be working on your project? Depending on the size of the project, you may have 4 or more unfamiliar faces working on and around your property anywhere from 2-5 days (and possibly more). You may even want to let neighbors know that you will be having some work done so they aren't surprised when they see a full crew and equipment working on your water feature for a few days. Hopefully this guide has helped to give you a basic checklist if you want to hire a pond or water feature contractor to build a beautiful and sustainable living landscape in your backyard. If you have any other questions, you can contact American Aquascapes using the form on this page, calling us at (336) 578-6123 or coming by our retail location in Graham, North Carolina. We are the true pond stars of the Triangle and Triad serving Raleigh, Durham, Chapel Hill, Cary, Greensboro, High Point, Burlington, Graham, Mebane, Hillsborough and more!